Hopewell Rocks at the Bay of Fundy in New Brunswick, Canada is an adventurer’s paradise. The waves over time have eaten away at the rocks and have formed beautiful rock formations. If you are up for an adrenalin rush, you can bring your canoe and interchange between walking and kayaking between the rocks. If you do not have a canoe, you can rent one at the Hopewell Rocks Park or from the several tour companies on the beach and get a kayak tour guide too. Nowhere else in the world will you enjoy sea kayaking as much as at the Bay of Fundy, with waves as tall as a five-story building, and the tide rises and falls an average of 35 feet, twice daily. It is a designated UNESCO Biosphere Reserve. 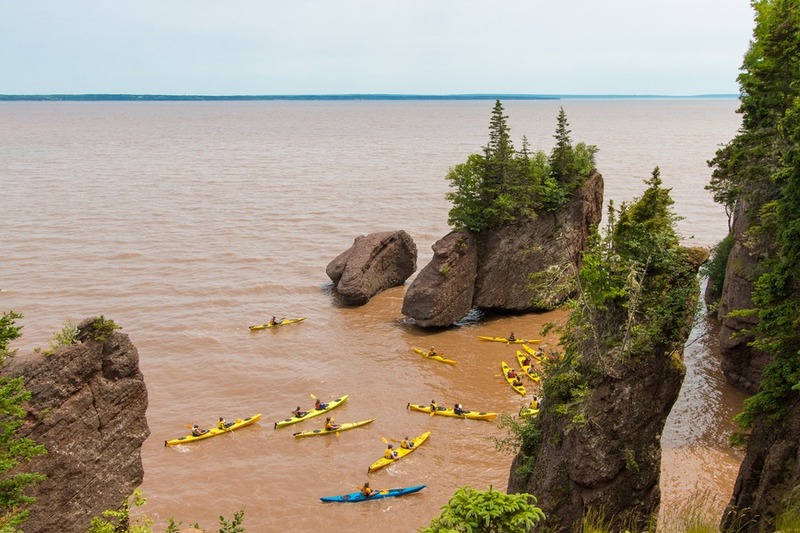 At the Bay of Fundy, paddlers can feed their adventurous cravings kayaking under giant rock formations. The routes turn and twist through narrow passageways and small tunnels. The tunnels and passageways open to a spectacular view of the Atlantic Ocean. For the daring adventurer, you can sign up for one of the mid-tide coastal tours, a route that skirts around the shore in front of the Hopewell Rocks. The best time to canoe among the Hopewell Rocks is in mid-August when tens of thousands of shorebirds swoop and whirl in unison above the bay. The shorebirds only come in August to feed and rest before embarking on their last part of a non-stop journey to South America. Adventurers are free to explore the bay and the rocks on their own or as part of a guided tour. During low tide, one can actually walk on the ocean floor.